As with years past, we will run open rotation fleet races early in the day to determine teams for evenly-matched team racing in the afternoon. Courses will depend on conditions and participation. All are welcome. Please RSVP using facebook or send us an email. We call this the “alumni regatta” mostly out of tradition – we would love to see parents and other friends of the team racing too! 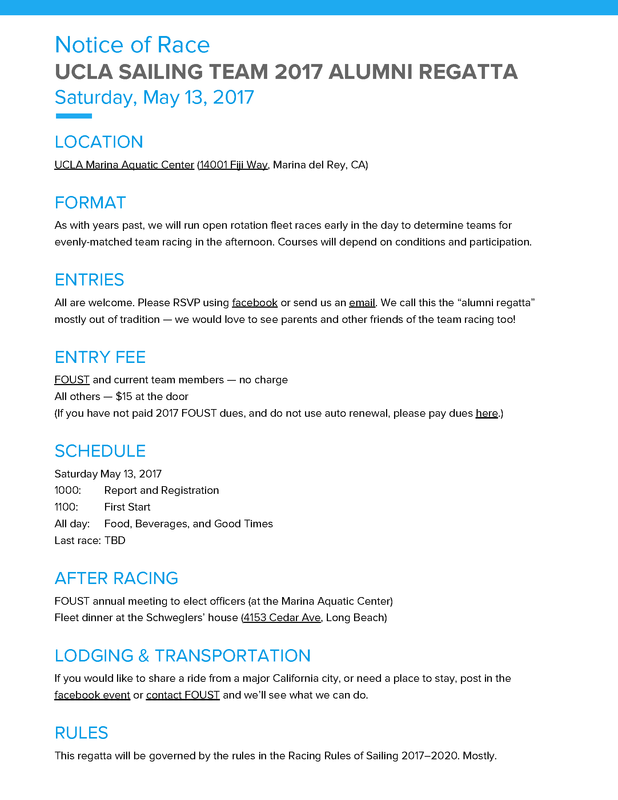 Note: It’s looking like this might be the last year that the Schweglers’ house is available for this event. Don’t miss this party! If you would like to share a ride from a major California city, or need a place to stay, post in the facebook event or contact FOUST and we’ll see what we can do. This regatta will be governed by the rules in the Racing Rules of Sailing 2017–2020. Mostly. The 2018 UCLA Sailing Team Alumni Regatta will be on Saturday, May 12, beginning at 10 AM at the UCLA Marina Aquatic Center! As always, we’ll do some fleet racing and team racing at the MAC and then head to Schweglers’ house in Long Beach for a fleet dinner and regatta party. Stay tuned for a Notice of Race with a little more information as the event gets closer. If you’re able to make it, please RSVP on the facebook event if you haven’t had a chance to do that yet, or you can send us an email if you’re not a facebook user. Also, the team is taking orders for long sleeve tech shirts for $35. If you’re interested, please complete this form no later Monday, February 12. A portion of each order will help the team cover the costs of competing at PCCs in Hawaii this spring. Other gear, including regular T-shirts, will probably be available for sale and/or raffle at the alumni regatta. You can also donate directly to support the team here. See you at the regatta!